Indian Bible College exists to disciple and educate Indigenous Native Christians for lifetimes of biblical ministry and spiritual leadership to their people and the world. The Esplins serve as Director of Admissions and Dean of Women. Coreen spends most of her time mentoring, counseling, and investing in the lives of the women. Daniel's primary role is recruitment but he also leads a mentoring group with first-year men and teaches a class called the Native Masculinity Collaborative. 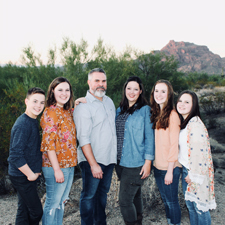 YoungLives serves teen moms in Mesa, Chandler, Queen Creek, Gilbert and Apache Junction through living intentionally alongside them, mentoring them and encouraging them to make healthy life choices for themselves and their babies. YoungLives also serves as the hands and feet of Jesus through one-on-one relationships with moms, watching them grow into their own relationship with Jesus, thereby changing not one, but two generations. KidZ at Heart International is an independent missions agency that trains leaders to facilitate spiritual formation for children within their own culture. It has over 25 staff members serving in seven states and six countries. The ministry also partners with the government of South Africa and accredited universities in California, El Salvador and Uganda to provide advanced degrees in children’s ministry. The BEM (Belgian Evangelical Mission) is a team of missionaries committed to building Christ’s church in Belgium with the desire that each inhabitant of Belgium will have a personal encounter with Christ. Jon & Stephanie, along with their four teenagers, Claire, Anna, Sam and Abby, join the team. They will partner with L’Autre Rive, a local congregation, to help them learn how the Lord is moving and building the Belgian church in a post-Christian society. Jon will be mentored by Pastor Luc Salsac as the entire family integrates into the community with the purpose of being salt and light. Or, as Abby likes to say, “Salty and lit”! Eagle Lake Camps partners with local churches around the United States to spread the Gospel to kids from different backgrounds through traveling day camps. Lindsey is the administrator for her leadership team and also mentors girls through leading a weekly Bible study. VMSS is a residential school that educates and takes care of 275 children, most of whom are orphans. The school is in its 9th academic year. Caleb's vision is to trigger generational transformations which will lift current and future students out of utterly hopeless life situations through education and the love of Jesus. Edgars and Anete are JV country leaders. They became followers of Jesus Christ through the efforts of North American churches short-term mission teams and have a deep appreciation of teams that serve in Latvia. They met in 2009, became a family in 2013 and they have two daughters, Dārta (2014) and Grēta (2017). They have a huge passion for the local church and together with the JV Latvia team they are praying and hoping to double the country team to 50 people in the next five years and to be represented in all five regions in Latvia (Vision 5-50-5). Josiah Venture wants to facilitate a movement of God among the youth of Central and Eastern Europe that finds its home in the local church and transforms society. Shelby works alongside local churches to reach the young people by creating a community for university students where they can be poured into and strengthened in their faith during this time of their lives. Raimonds’ main and only focus is to make disciples who will make disciples. He serves as a pastor/deacon in a local church and loves to preach on youth nights. The church just started a sports program for youth as part of the mission to reach young boys and girls for Christ. He also serves on the Josiah Venture Latvia Board. Marta is a real hero… a huge support for her husband and a full-time mom. The primary focus of Anne’s ministry is providing trauma care training. She provides training to ministry leaders, pastors, students and young adults so they can help other individuals heal from their own physical, emotional and spiritual wounds and, in turn, respond to others in a more compassionate way. She also facilitates Bible studies for women and serves as a mentor. Micah is the founder and lead pastor of a church called University Community Fellowship. Being next door to one of the largest universities in Sub-Sahara Africa (over 30,000 students), the church primarily focuses on preaching the gospel to the demographic of college students and emerging professionals. We’ve have been in partnership with Micah and his wife Grace since 1999.